China’s powerful Communist Party is not exactly a fan. 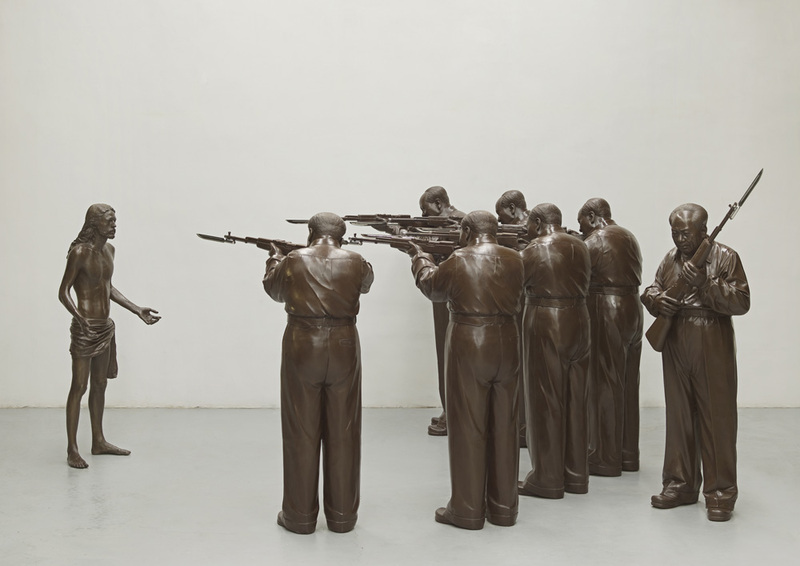 Over the years, police have canceled the Gao Brothers’ exhibitions, raided their Beijing studio and confiscated their art. But the brothers refuse to play nice: They show politically edgy, mixed-media work at underground exhibitions, and they aren’t afraid to speak out against the government even after communist authorities detained dissident artist Ai Weiwei without charges for nearly three months this year – a move Ai’s supporters claim was a punishment for discussing social problems and criticizing the Party. The Days of Yore caught up with the Gao Brothers this summer through a translated email exchange. You both grew up in Shandong Province in the 1960s – what was your home city, Jinan, like in those days? In the 1960s, Jinan was still small: There were no skyscrapers or tall buildings, no elevated highways, no crossover intersections, and the streets weren’t congested with cars as they are today. Most people lived in one-story houses, and they mainly walked, biked, and rode buses. You were kids, and later teens, during the Cultural Revolution – and your family was deeply affected by Mao Zedong’s policies. Please explain. During Mao Zedong’s Cultural Revolution, our father was taken away for interrogation, and he died on October 25, 1968. The Chinese government said he committed suicide, but his body, which showed obvious signs of abuse, was cremated without a coroner’s examination. To this day we are unsure about the cause of his death. At the time, the six children in our family were still young, and our mother didn’t work, so our family depended on our father’s income. After his death, we had no source of income… We had no choice but to leave school, and we survived thanks to assistance from our aunt and uncle. When and why did you begin making art? We’ve enjoyed painting since we were kids. Our second-oldest brother was our biggest influence; whatever he drew, we copied it. Without a doubt, our artistic talent comes from our mother. She was skilled at making paper cuttings. They seemed to naturally flow from her heart; they were infused with beauty and different from traditional styles of paper cutting. In 1972, Gao Zhen began his formal artistic training. At the time, because our impoverished extended family did not have the means to support our studies, and because we hadn’t graduated from high school, we began six years of working as hired laborers. But we also began taking Chinese brush painting lessons from a relative of ours, Zhang Dengtang, who happened to be a famous painter. Under his guidance, we studied many famous Chinese brush painters from the Song, Yuan, Ming, and Qing Dynasties, as well as modern painters. Some of the older, more established members of the Shandong art community recognized our talents, and we were eventually given an apprenticeship with Mr. Wang Tianchi, who had been an apprentice of [the artist] Qi Baishi. Under Wang we studied “Qi school” freehand/freestyle painting. We started creating artistic pieces together in 1985. Art is our calling: There are some things in our inner heart that can only be expressed through the artistic medium. Have you always made art together? What was the first piece you made together? A performance art piece. It was a summer night in 1985, and we were discussing Simone de Beauvoir’s  novel All Men are Mortal. Suddenly the electricity went out, and our room went pitch black. We were inspired by the enveloping darkness… We lit an oil lamp and did an improv performance, and from that we created the film collection “Narrative of Life”. Why did you move to Beijing in the early 1980s? During the 1980s we often rode the train from our hometown, Jinan, to Beijing, because the cultural atmosphere in Beijing was much better, and because we had a lot of friends in the artistic community there. We established our own painting studio in Beijing in 1997. What do you remember about the art scene there? At the time, Beijing had only a few galleries – it was nothing like today’s Beijing, which has so many art districts, galleries and museums. There were also far fewer artists around. How did you make money to pay rent? With difficulty. There weren’t many collectors around, so it was hard to find a market for our art. We have always enjoyed vegetarian food: vegetables, fruit, grains, and a bit of fish. How did your style evolve from the early 1980s to the late 1990s? The style of our painted works from the early 1980s was something close to expressionism and surrealism. By the end of the ’80s, we were experimenting with paper cuttings, installation art, sculpture, performance art, film and other mediums, and also began to define our own personal language of artistic expression. In 1988 we did an installation art series. 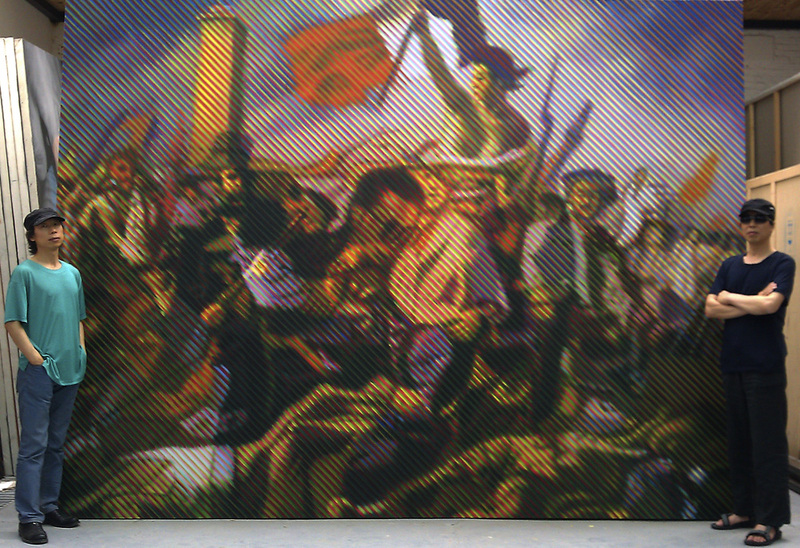 One of the works from the series, “Midnight Mass,” which was entered in the first-ever Chinese Modern Art Exhibition held by the National Art Museum of China. “Midnight Mass” attracted a lot of attention and quickly brought us into the spotlight. In the early 1990s, we used a printing machine to make a series of prints and engravings that expressed our growing political consciousness. During the mid-90s, we tried to embrace a transcendental mentality in our creative process. It required two years to create our “Big Crosses” installation series, which received a lot of attention from critics and scholars. During this period we also exhibited our “Plaza Mass” installation at Tiananmen Square and other installations, films and performances. In the late ’90s we started to organize events that fused the various mediums we were working in. Even though our style has been evolving throughout our career, an attempt to transcend reality has always been at the spiritual core of our work. Who were your biggest influences during that period? Michelangelo, Pablo Picasso and Joseph Beuys. Why do you work in so many mediums? We have too many thoughts and ideas that we want to express; some ideas are best expressed through painting, others through film or sculpture. I was pleased to read about the “World Hug Day” events you began staging in 2000. Why do you promote hugs on a global scale? 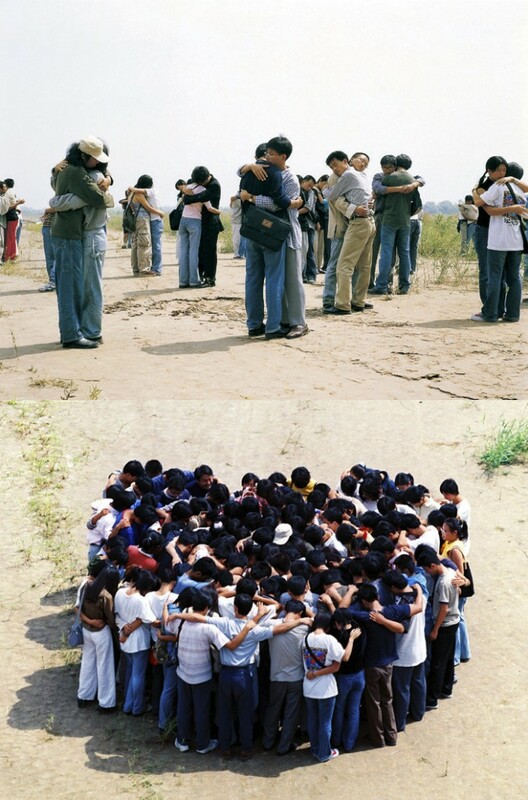 Because we feel that this world really needs a hug, and we look forward to the day when all the world’s people can hug each other. Is there anyone you would not hug? We are willing to hug anybody so long as they are willing to hug us. 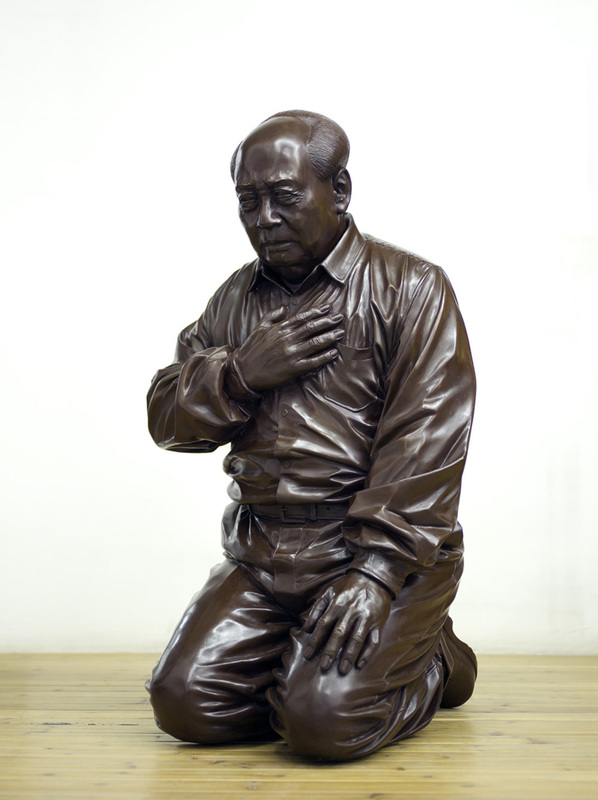 You’re famous for your satirical sculptures of Chairman Mao – why do you focus so much on Mao and his legacy? Because Chairman Mao has had a lasting and negative impact [in China], and the impact can still be felt. In order to deconstruct and eliminate the mythology that surrounds his image, we need to thoroughly criticize him. How does your treatment of Mao resonate with Chinese who were born after the Cultural Revolution? Actually, most of our work that deals with Mao Zedong cannot be publicly displayed in China; most Chinese people only access our work via the internet. Some Chinese people praise it while others despise us for it and use incredibly vicious language to attack us; some people have even encouraged the government to punish us for making this work. In 2009 you said you were planning to stop making Mao-focused art for a while. What subjects are you focusing on now? In Beijing you hold invitation-only openings – why? Some of our more sensitive pieces cannot be publicly released in China; they can only be shared with friends in the casual gatherings we hold in our studio. In order to avoid [police] nuisance, our studio is only open to friends. Chinese authorities have confiscated some of your works, and they could arbitrarily detain you if they chose to – as we saw in April when Ai Weiwei, a Chinese artist who has been critical of the Chinese government, was detained in Beijing (without charges). Given the risks to your personal freedom and safety, why do you continue to make such politically aggressive artwork? As artists, we need to be true to ourselves; otherwise art loses its meaning. If we ‘lost ourselves’ because we were afraid, we wouldn’t be able to live with ourselves. Have you ever considered moving away from China in order to escape censorship? From 1989 to 2003 we were forbidden from leaving China, and at that time we really wanted to leave. Later on, we rarely thought about leaving. Even though there is some control over what we can publicly release in China, there is no control over what we create. As long as we will never be imprisoned just for making our art, we will stay in China. We love our homeland. Last fall you staged your first U.S. show. Do you notice any differences in the ways that American and Chinese audiences respond to you work? Before we did our show at the Kemper Museum of Contemporary Art [in Kansas City] last September, we held three gallery showings in New York, Chicago and San Francisco. 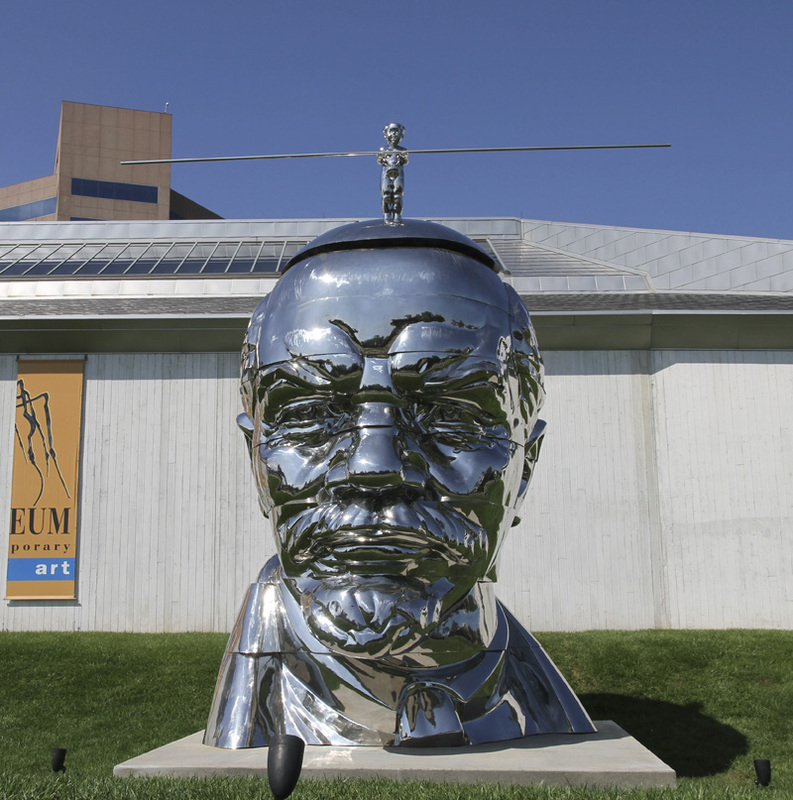 The show at the Kemper Museum was the first show we had ever done at an American museum, and most of the pieces we displayed there had never been publicly released in China. At the reception, the audience asked so many questions that we got the impression that people in the American art world may be more curious about our work than people in the Chinese art world are. Are you in contact with any of your old teachers from your hometown? What do they say about your work? We have been away from our hometown for more than 10 years, and our old teachers have taken very different paths from us, so we don’t keep in touch with them. What advice do you give to young Chinese artists? We don’t give them advice; every artist needs to forge his or her own path. Other people’s advice is useless on such a journey. Interview by M.I. ; Chinese-to-English translation by a China-based translator who requests anonymity. This entry was posted in Visual Artists and tagged Chinese artists, Chinese dissident artists, Gao Brothers. Bookmark the permalink.